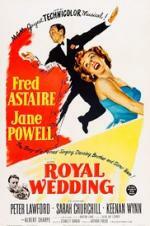 Buy or Rent Royal Wedding (1951) Movie DVD & BluRay Online! Movie Plot: Tom and Ellen Bowen are a brother and sister dance act whose show closes in New York. Their agent books them in London for the same period as the Royal Wedding. They travel by ship where Ellen meets and becomes involved with Lord John Brindale. This causes her to miss a rehearsal. Tom (Astaire) uses the time to dance with a hat rack and gym equipment. Later Tom and Ellen attempt a graceful dance number as the ship rolls. Upon arrival Tom holds auditions and meets Anne. There is much indecision by the siblings about their romantic partners even though they are in-the-clouds. Tom dances on the walls and ceiling of his hotel room. All ends well in this light musical. By the way, there is a vaudeville-style dance number in their show that features slapstick. It’s a hoot.